Hola Nashville - Queen of Queso (AKA Delia Jo) here again, reporting for duty at newly opened Nada in Midtown. You can bet your bottom peso I have been sampling the heck out of some cheese-y concoctions since moving to Nashville (I think I've had at least 15 bowls in these 3 months). So... I think have a pretty good pulse on the queso scene here already. ;) Plus, after 9 years of Texas living and with my great DFW Queso With Delia Jo Master List under my belt, I think we all can agree, I eat drink, breathe all things queso. I won't lie, when I heard a popular concept that originated in Cincinnati was opening a taco joint in town, I thought to myself "Do they even know tacos?" I figured the queso would be par for the course in town. I. Was. Wrong. Get thee to Nada. Now. Stay tuned to read exactly why, if you haven't already seen my Instagram post and stories from my visit. Nada was perhaps my biggest surprise since moving to Nashville. I've eaten in 70+ restaurants and Nada was one I perhaps underestimated that I shouldn't have. Owned by David Falk's Boca Restaurant Group, the Nashville location is the 4th for the concept. Located on the ground floor of the Aertson Hotel building in Midtown, the 6000 square foot space is flanked on one side with floor to ceiling windows, making the space seem even larger. The bar shelves from floor to ceiling allow views to the bustling outside, as they are also built along the large windows and capped by a red patterned tile ceiling, adding to the festive feel of the space. Each seating section of the restaurant has a different feel, and there's a private room for larger parties. The patio will be nice when spring arrives (or when we have another random awesome winter day). Enough chitchat. You're waiting on the food, right? To start, step 1: salsa trio. Every good Mexican meal starts with chips and salsa, and Nada takes it up a notch by offering a binge-worthy trio. The mildest of the three, the red one, is a fire-roasted tomato ancho salsa that is tame enough for those who don't love spicy food. The green sauce is of a medium heat level, a serrano salsa verde. I feel in love with the yellow bowl, a habanero salsa they call "the kreeper" because the heat, indeed creeps up on your tongue with this one, a slow burn. The Kreeper Habanero Salsa makes another appearance at the bottom of the queso bowl. Bonus points for the queso presentation at Nada - they pour the melty smoked gouda atop the habanero salsa table-side. The "Queso Gringo" becomes complete with the addition of black bean puree, peppers, and pico. Truly a treat. If you don't finish yours, call me. I want it. I called it at first taste. Best queso in Nashville. Hands down. While you stuff your face (no judgment from me!) with their house-made crisp chips, salsas, and queso, decide from their wide selection of tequilas, mezcals, margaritas, and other cocktails. When first dining, the classic Nadarita seemed a nice start. It's available by the glass or by the liter, so this also makes for a great large party option. The taco selection at Nada features some fancy and some familiar. My favorite was surprisingly a vegetarian one, the Caramelized Cauliflower Taco. The Mexico City Pastor Taco was also excellent and well seasoned. For me, with appetizer intake, two tacos was plenty, but they are small street-style tacos, so if you're extra hungry order 3-4 (or eat more queso). I found the "Bolsas" section of the menu quite interesting. Choose from Pork Shoulder Carnitas or Lobster -which is sort of a Mexican play on a Lobster Roll, served in a bread pocket. There are also enchiladas, soup, and salads available on the lunch and dinner menus. Sides-wise, be sure and order the wood-grilled elotes (street corn) and the sweet chile-glazed cracked potatoes, for a little something different to share with the table. Though you'll likely be too stuffed from all that queso and other goodies, dessert should still be on your radar at Nada. 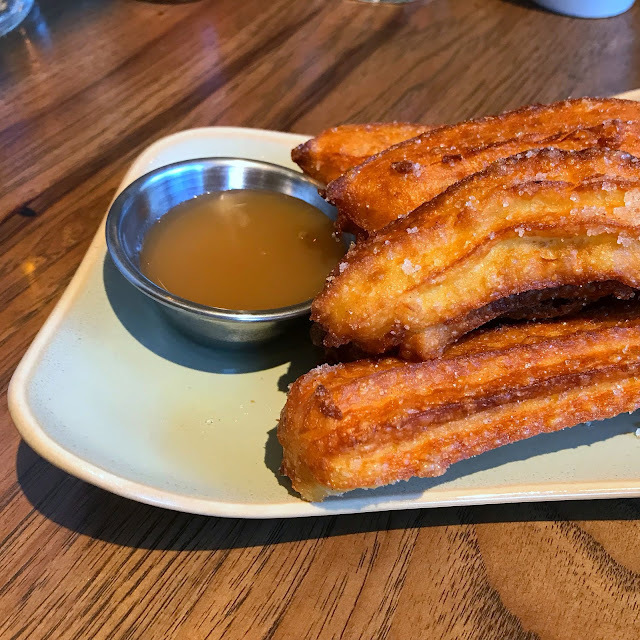 The churros are made to order and served hot with caramel dipping sauce. The Riz Au Lait, a rice dessert, is a suprisingly strong sweet finish to my wow-ing experience at Nada, topped with Cajeta and crispy peanuts. There's a new taco joint in town, Nashville, and I think it's safe to say, she's a keeper. Go in and experience this exciting breaking queso news for yourself. 10:30 a.m. to 10 p.m. on Sunday. *My tasting was complimentary but, as always, the Queen of Queso tells you her own opinion at all times.